Do you know where seamen felt at home in Lübeck when returning from journeys around the world? One place would definitely be the Seaferer's Guild - "Schiffergesellschaft", one of the most beautiful pubs in the world (nowadays a restaurant). But of course they also had their homes in those quarters - in the small lanes and alleyways. Enjoy a bit of medieval harbour feeling on our tour! One could call Lübeck’s courtyards and alleyways unique, hidden behind impressive facades dating back to the times of the Hanseatic League. Enjoy those oases with their atmosphere of peace and quietness on a relaxed walking tour. We will show you the hidden treasures of the city and the life of Lübeck’s citizens in the still quite medieval surroundings. In the Middle Ages people did not enjoy today’s social advantages and security – which made life much more difficult. 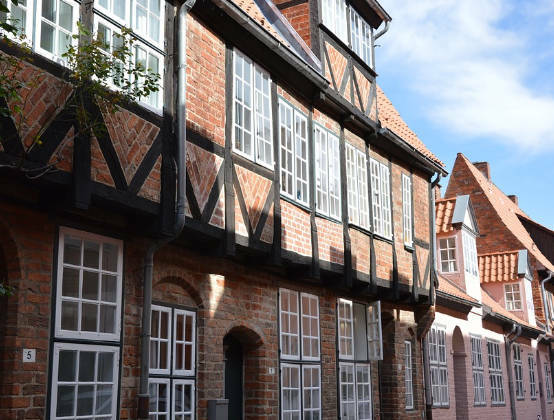 Lübeck’s citizens established a number of foundations – some of which still exist nowadays. Come on a tour with us through the beautiful and idyllic courtyards and buildings of those foundations! Narrow houses with a variety of colours and facades line the picturesque streets around the craftsmen’s church St. Aegidius. Enjoy a walk through those lovely little lanes and discover the old craftsmen’s work places. Busy life behind those mighty facades of the old merchants‘ houses – precious goods changing hands. The Hanseatic League’s merchants were considered to be honest and reliable, cosmopolitan and efficient. We will make traditions and old customs come back to life for you. Henry the Lion founded and built Lübeck’s mighty cathedral in the southern part of the city. Not only the clergy lived around the cathedral, but also the boatsman who brought salt from 100 km away on their little prams along the Stecknitz Canal (today Elbe-Lübeck-Canal). In those numerous little alleyways it’ll be easy to image life in the Middle Ages.